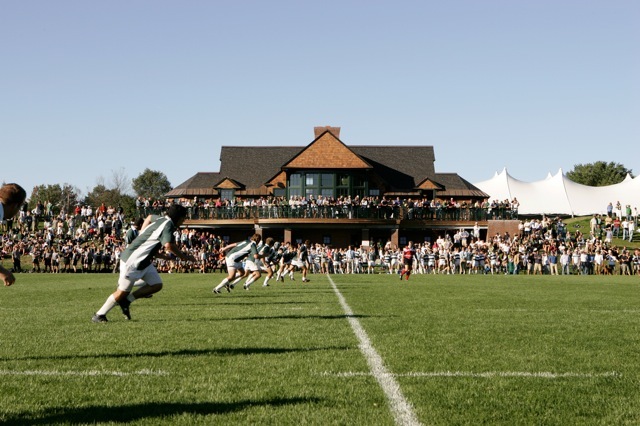 Hanover, NH- Dartmouth hosted the Ivy League 7s Tournament this weekend. With the whole Ivy League present except for Princeton, Dartmouth entered two teams into the tournament. The Big Green looked to defend its home turf and did not disappoint this weekend. Both the A and B side teams swept their respective brackets to secure a first and second place finish. The A-side team dominated their games with a score of 35-7 over Cornell, 57-0 over Columbia, and 42-0 against Penn. The B-side was equally as dominant beating Brown 26-12, Yale 40-0, and beating Harvard in the closest match of the day 24-17. The Big Green played one additional friendly match against Cornell with a mixed squad and won 24-7. The A-side started off the tournament with an 11:00am kickoff against Cornell. A quick try from the new Captain Hayden Aldredge put Dartmouth up 7-0 followed by some nifty passing between Max Parker and John Abraham for a 14-0 lead. Just before the half Co-Captain Dawit Workie hit Max Parker with a beautiful pass to give Dartmouth a comfortable 21-0 lead. Ollie Engelhart and John Abraham started off the second half with a couple of quick tries. However, Cornell slipped through the Dartmouth defense to put Cornell on the board. With time expiring Ollie Engelhart had a beautiful spin to break through the Cornell line and score under the posts to finish off the game 35-7. Kickoff against Columbia started at 12:00 with a perfect kick from Dawit Workie directly into the hands of Hayden Aldredge who proceeded to step through three Columbia defenders and give Dartmouth a 7-0 lead just 11 seconds into the game. Dartmouth continued its dominant pace scoring a total of 9 tries to smash Columbia 57-0. In the last game of the A side against Penn, Jack Braun got the Big Green started with some quick feet and a try in the corner to secure a 5-0 lead. With a beautifully placed restart kick, Dawit Workie sent the ball straight into the hands of freshman Struan Coleman who scored his first try of the day. Next Kyle Bramble continued his dominant day dashing through a number of Penn defenders to extend the lead to 15. Solid defense from Dartmouth and a huge poach from Dawit Workie put the ball back into the hands of the Big Green and John Abraham who scored his first try of game under the posts. Dartmouth led Penn 22-0 going into the half. The second half was marked by an even more dominant showing from Dartmouth as Krieg Greco, Max Parker, and John Abraham all recorded tries. With a final score of 42-0 the A side capped off their day. Dartmouth’s B-side started the day off against Brown. With some solid defense Dartmouth was able to turn the ball over and work it out to Gordon Driscoll who stepped his way into the try zone for a 7-0 lead. Next freshman fly half Jack Badenhausen easily ran through a couple Brown defenders to extend the lead to 14. With another big turnover and nice passing Dartmouth worked the ball out to winger Chris Nkoy who used his speed to dash around the Brown defense and take it all the way. Dartmouth led 21-0 going into the half. Receiving the ball at the start of the second half, Dartmouth was quick to get on the board again with a powerful run from Krieg Greco. On the restart Benny Goodman placed a beautiful ball into the hands of Chinedu Okafor for the steal. Unfortunately some confusion led to a Brown interception and try. With time expiring Brown was able to get one more score in before the whistle, however Dartmouth came out on top with a score of 26-12. Next Dartmouth faced off against Yale. Looking for redemption after a tough loss in Bermuda, the Big Green came out looking sharp and tough. With a full head of steam, Krieg Greco barreled into the try zone for a quick Dartmouth lead. However, the big man wasn’t done and punched another one in off of a scrum in Yale’s red zone. A huge run from Steven Hinshaw put Dartmouth up 21-0 at the half. At the start of the second half, another big run and off load from Steven Hinshaw led to a try from Ian Sullivan. With some great place kicking from Benny Goodman to Chinedu Okafor, Dartmouth was able to maintain the ball and get it through the hands to Chris Nkoy who put Dartmouth up 33-0. Dartmouth’s defense proved too tough for Yale causing a turnover and another powerful run from the big man Hinshaw who scored his second try of the game and helped Dartmouth finish out the game 40-0. In their final bracket play matchup Dartmouth faced off against number 2 seed Harvard for a place in the finals against Dartmouth A. A beautiful defensive interception from Jack Badenhausen gave Dartmouth a 5-0 lead. However, Harvard was quick to retaliate with a try of its own taking the lead 7-5. Some solid passing from Dartmouth and a selfless pass from Gordon Driscoll led a full field try from Chris Nkoy putting up Dartmouth 12-7. Unfortunately, a few knock-ons and some nice steps from Harvard led to a couple Harvard tries giving the Crimson a 17-12 lead. But Dartmouth wasn’t ready to quit. A beautiful dummy by Jack Badenhausen led a great try tying up the game at 17. With only seconds left and Harvard ball, senior Will de Chatellus commanded a great defensive push pressuring Harvard into a lofted pass, which Andrew Zhu grabbed and ran into the try zone for a nail biting Dartmouth win and securing a Dartmouth sweep. Unfortunately due to injuries Brown was not able to play in its playoff matchup so Dartmouth entered a mixed team against Cornell in a final match. In the hard-hitting matchup Dartmouth scored first with a great run from Kyle Bramble. Max Parker was quick to extend the Dartmouth lead using his speed to score a try in the corner putting Dartmouth up 12-0. However, the winger was determined to show his defensive skill and intercepted a Cornell pass leading to another Dartmouth try and halftime score of 17-0. The second half proved to be a defensive battle with no one able to score for a few minutes until a great run from Chris Nkoy gave Dartmouth a 24-0 lead. With less than a minute left, Cornell ran a switch and was able to get on the board, however the effort was too late as time expired giving Dartmouth a 24-7 win and capping off the day. A great turnout, nice weather, and some cheeky Dartmouth Rugby led to a great tournament win for the Big Green. Going forward the Big Green will look to continue its success. Gavin Hickie offered his remarks about the rest of the season saying, "We have a very competitive extended 7s squad and we will travel to Westpoint on May 15th for a 7s tournament before we set our sights firmly on the CRC."